Your culture is the beating heart of your company. And understandably, most candidates want to get a real feel for what working at your company will be like on a day-to-day basis before they accept an offer. The question is: what’s the best way for you to show them. Note: The percentages in the graphic above don’t add up to 100% because survey participants could select up to three options for how they want to learn about company culture. If you’re interviewing many candidates or any who live far away, bringing them all to the office can be tricky. But while video and phone interviews might be easier and cheaper, they simply can’t give candidates the same glimpse into your culture that an onsite interview offers. That’s why more than half (51%) of candidates are eager to peek behind the curtain in person in order to visualize themselves working there. Office visits are especially important to candidates who weren’t previously aware of your company, with 59% of those surveyed finding it important compared to just 46% of those who already knew who you were. After all, it’s harder to commit to something you know little about. While the data is fairly consistent across all age ranges and seniority levels, candidates at the VP level are generally more interested (63%) in visiting the office than others. Women are also slightly more likely to want to come look for themselves, with 54% interested as opposed to 49% of men. There are plenty of ways to make an office visit a regular part of your interview process, from tours to open houses. You can also just take the candidate for a brief wander around before or after the interview—even a quick glimpse can tell them a lot. And, If you find you can’t bring a candidate onsite, take inspiration from companies like Intuit and General Mills who are using virtual reality to provide candidates at career fairs a virtual tour of their office. You can also simply post a video tour of your office or a “day in the life” of an employee on your website. The person who tells the candidate about your culture may matter more than you think, even if they’re saying the same thing. In fact, 50% of all candidates surveyed said that the person they most wanted to hear about culture from was the hiring manager. This might be because people unconsciously respond best to their future boss. 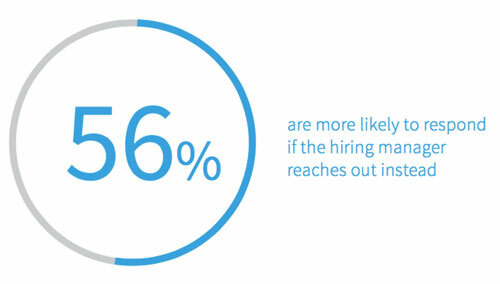 As the report revealed (and as we’ve seen for InMails, too), 56% of candidates are more likely to respond to outreach messages when they come from the hiring manager. Candidates in the US (63%), China (67%), and Singapore (64%) are especially interested in hearing about your company’s culture from the hiring manager. You can easily work a discussion into your office visits. Arrange with your hiring manager to chat about the culture during the candidate’s interview, or maybe conduct a tour of the office. It makes sense that so many candidates want to hear from current employees, since they’re the ones on the front lines that really know what working for the company is like. That’s just one reason why coaching employees to become brand ambassadors pays off in such a big way. So make sure your candidates have a chance to hear from employees, during onsite interviews, open houses, and at career fairs, or even just through blog posts and testimonials on your website and social media. 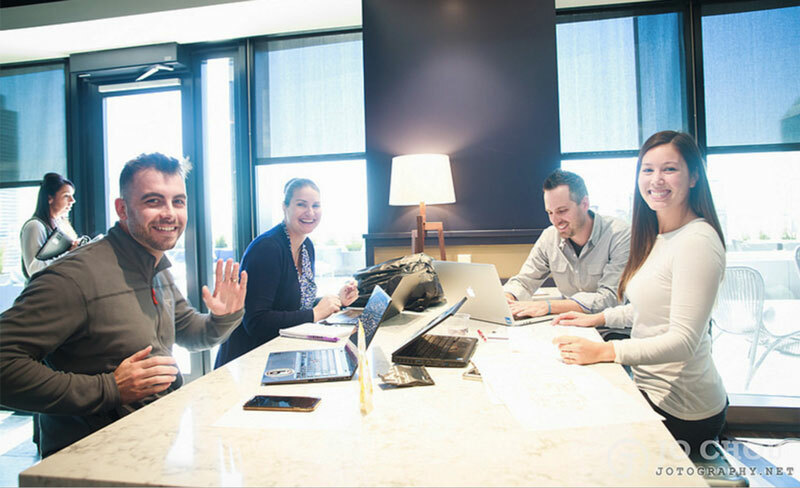 One way to get started is by developing an employee ambassador program that both educates your employees on your brand messaging and encourages them to share what life at your company is like with their network. Candidates are looking at your website—more than half (53%) say it’s their first stop when applying for a job. And, 27% want to learn about your company culture when they visit the site, so all those pictures of office shenanigans on your phone can finally be put to good use. Candidates who weren’t previously aware of your company find the website more useful for understanding your culture (28%) than candidates who knew about the company already (22%). This could be because these are the candidates most likely to be researching you before applying or responding to your outreach. But since most candidates will refer to your website again before the interview, pictures and videos of your culture can get them excited to come and see it for themselves. For a little inspiration, take a look at Lyft’s career page video, which perfectly showcases the company culture, without sacrificing any important information. Spotify is also clever and gives candidates a glimpse of what employees are like by showing their employee’s own Spotify playlists on the website. 24% of survey respondents said that their recruiters best helped them learn about the company’s culture. 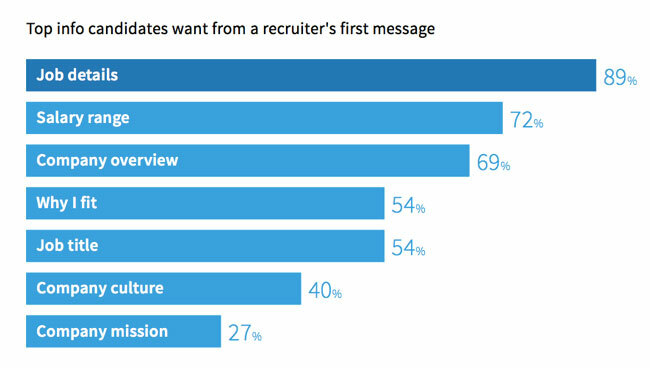 In fact, 40% of all candidates surveyed said they want to learn about culture from the recruiter’s first outreach message. In some countries in particular, candidates found the recruiter extremely useful for giving them insight into the company culture. In France, 43% said the recruiter had helped them best, with that number being even higher in Japan (63%). If you want to be even more helpful, you can weave some tantalizing glimpses of your culture through every communication with a candidate by improving your storytelling skills. It could be as simple as telling them what a typical day in the office is like, or sending a personal note about what you love most about working there. It’s also a good idea to point them in the direction of employee blog posts, videos, and any other employee generated content.